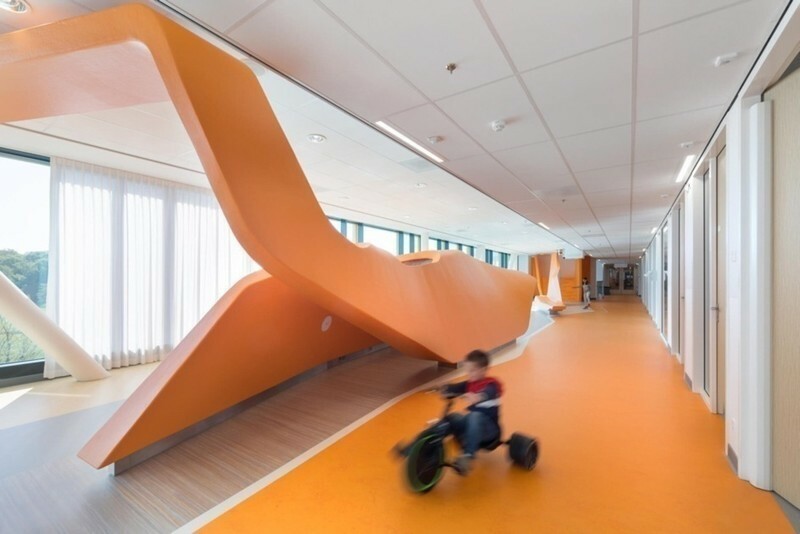 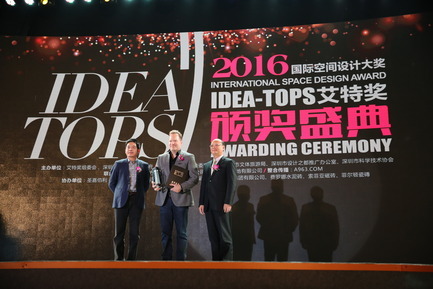 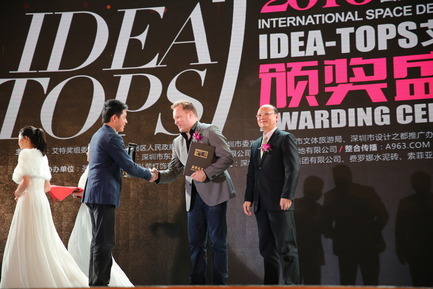 Architectural and interior design firm M+M Creative Studio has been honored by the 2016 International Space Design Award, IDEA-TOPS as the winner of “The Best Office Design Award” (awarded December 6, 2016 in Shenzhen, China) for its work on the new corporate headquarters of car shopping company Edmunds.com in Santa Monica, California, USA. 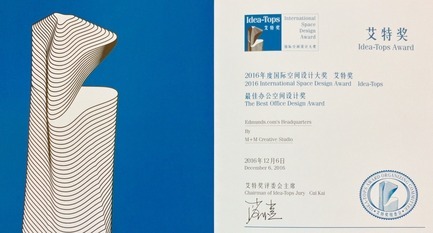 The Edmunds.com Headquarters commercial office space was recognized as the winner in this category from over 650+ entrants from around the globe by IDEA-TOPS, which honors and recognizes the best design in the disciplines of architecture, interior design, graphic design, art installation, urban design with the goal of advancing the appreciation of architecture and design worldwide. 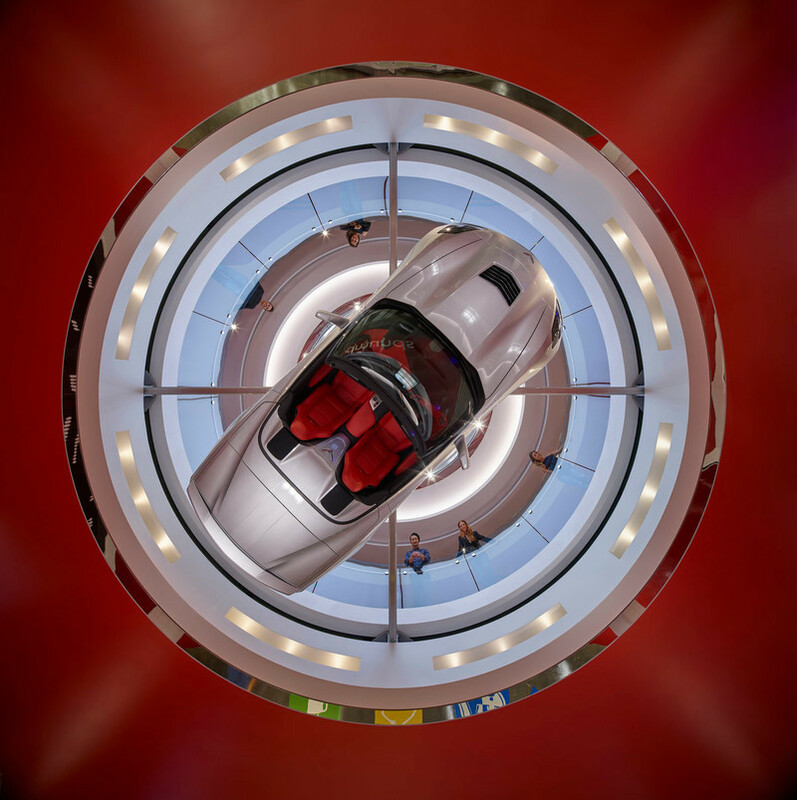 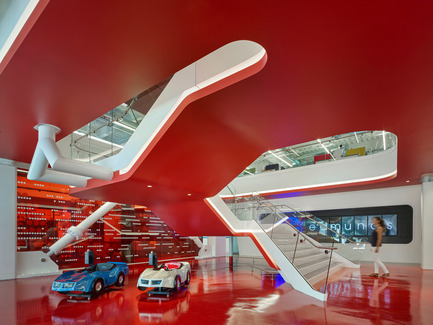 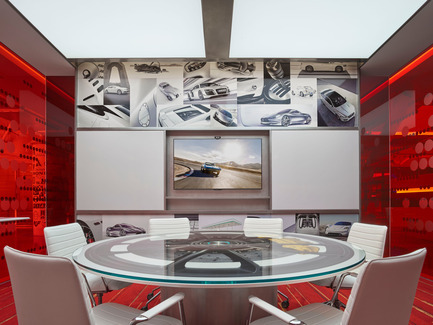 With two floors and outdoor space totaling 143,000 square feet, Edmunds’ “EdQuarters” is an inventive space that weaves together a cross-section of tech and automotive-themed designs. 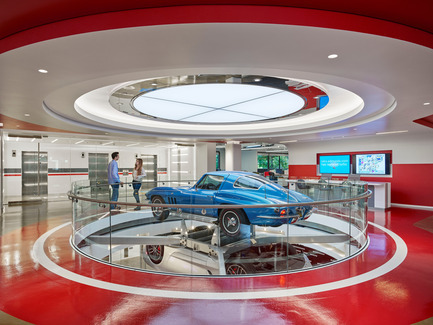 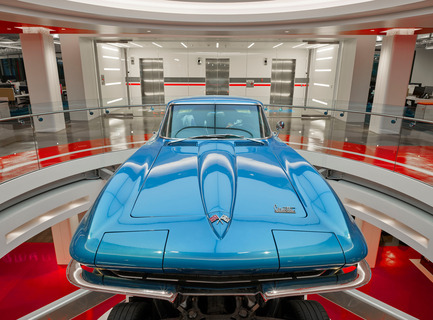 The first floor is anchored and highlighted by two Corvettes mounted and turning in unison above the mirror-polished stainless steel reception desk. 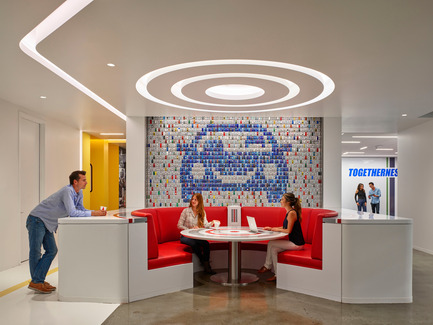 Other design features on the first floor include a long and elegant coffee bar where employees are encouraged to gather and interact, a mosaic of 2,472 ‘Matchbox’ cars assembled to form Edmunds’ logo, and a 1948 Cadillac that has been converted into a beer tap and bar. 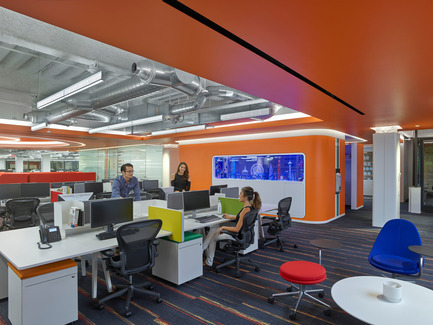 The bulk of the second floor is comprised of a plank-desking system that allows flexibility in linear feet per person, as well as additional smaller meeting rooms dispersed throughout and miscellaneous programmatic requirements such as quiet rooms (‘Rest Stops’) and an IT service desk (the ‘Pit Stop’). 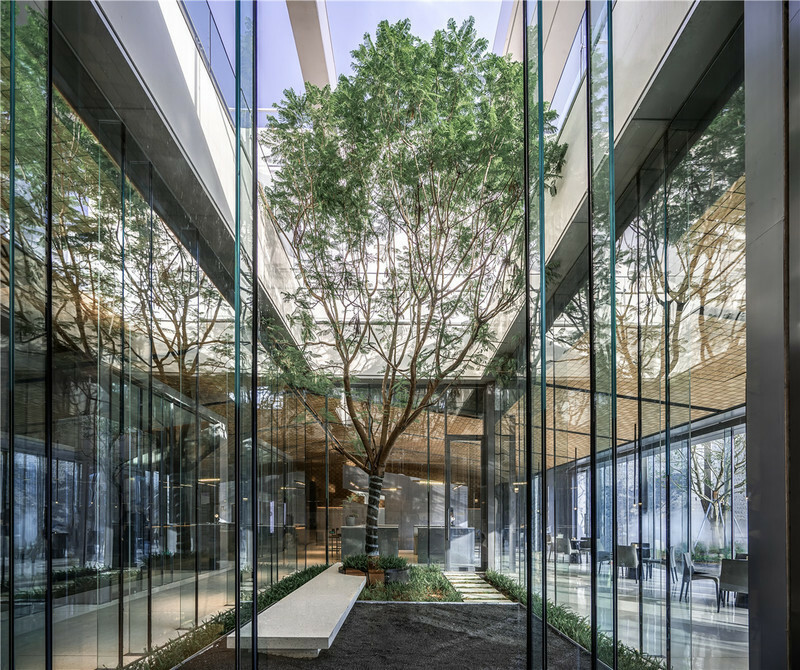 Meanwhile, a 10,000 square-foot exterior central atrium offers both larger social and more intimate spaces connected to the adjacent interior spaces with over 130 linear feet of retractable glass doors. 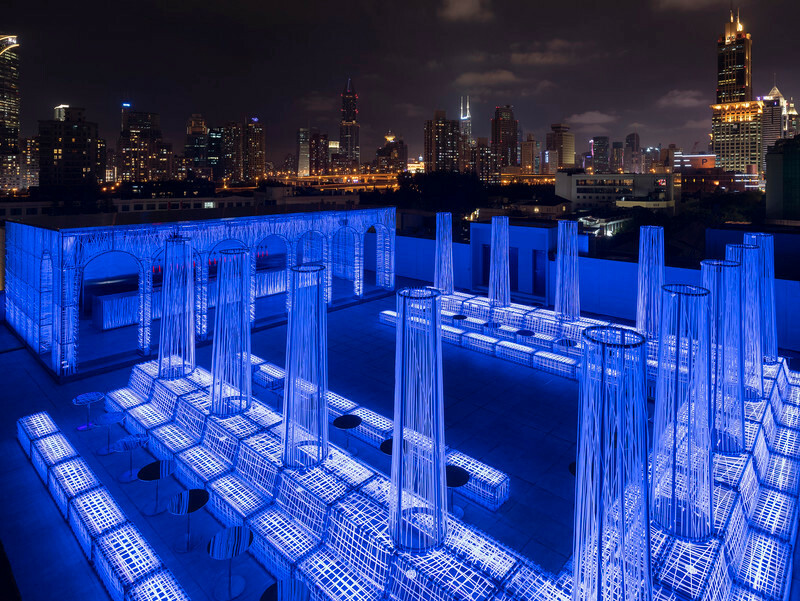 Inside the atrium itself, the multiple 15’ long raised linear planters, gurgling water features and in-ground LED lighting run in parallel lanes like cars seen from above passing on a super-sized highway. 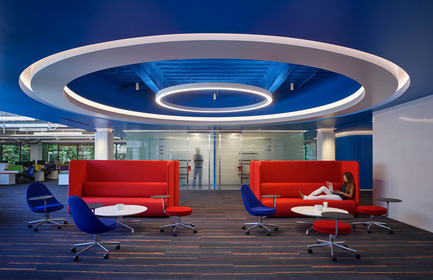 Established in 2010 by the award-winning husband and wife team of Chris Mitchell + Sandra Mitchell, M+M Creative Studio specializes in creating spaces that enhance the everyday experience. 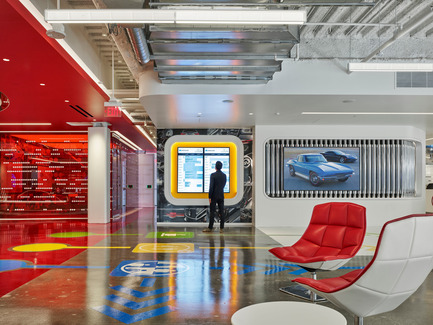 M+M brings focus and accountability to each client’s unique vision through tailored solutions and exceptional hands-on service. 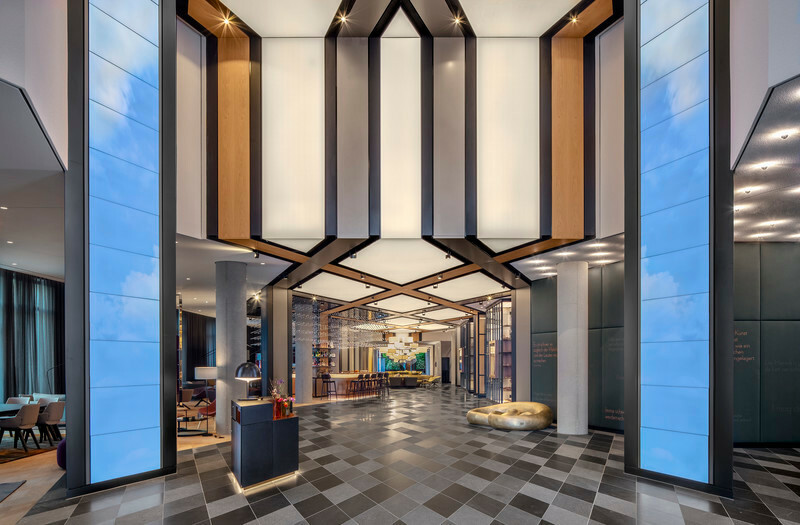 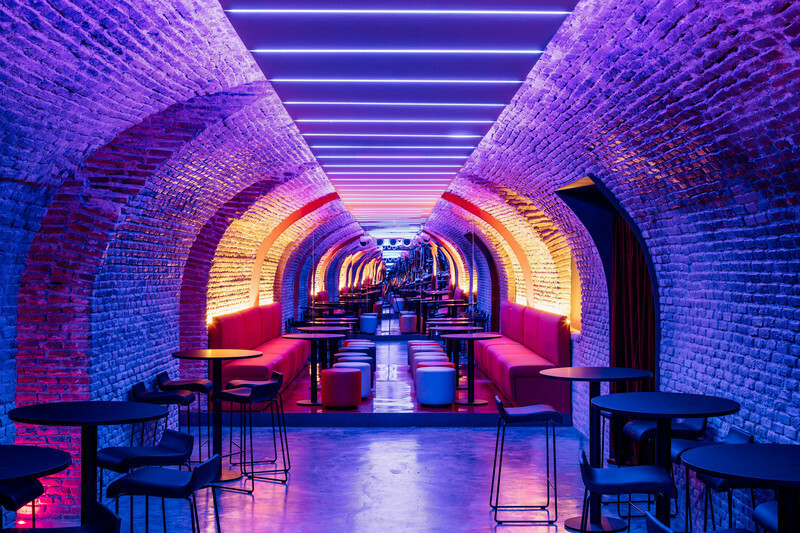 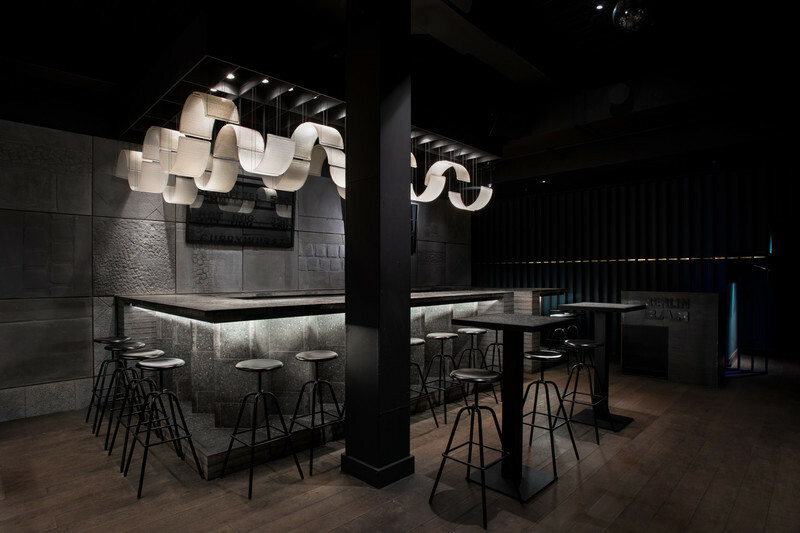 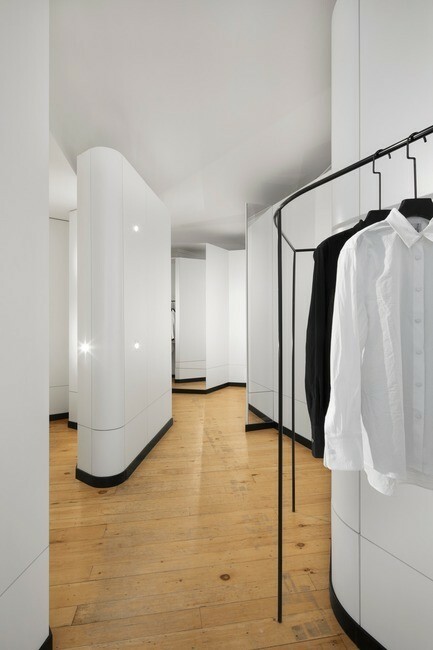 Its expertise and global perspective derive from over 48+ cumulative years of architectural and interior design creating spaces that are equal parts design and value-add service. 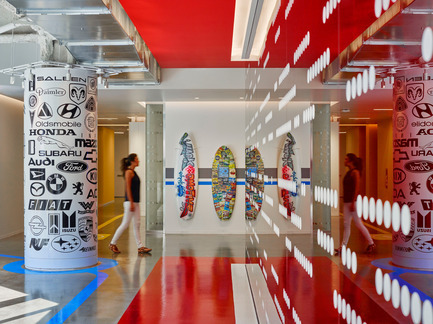 The Las Vegas, Nevada-based firm has been recognized with multiple honors and awards. 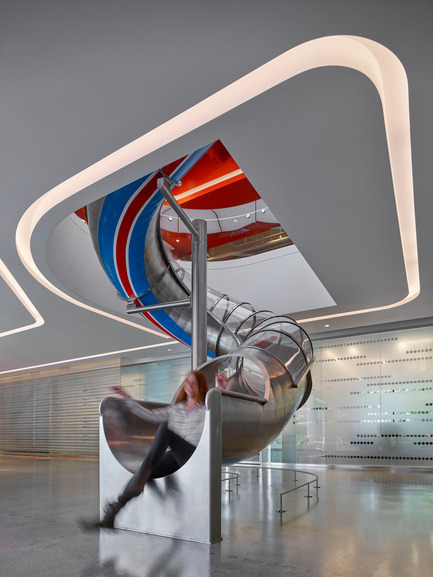 Edmunds - Slide from 2nd floor - called the "expressway"